Whew. It's been quite a while since our last recipe post, and that just won't do. !So I asked our Chef, Ryan Castille, what might be a popular and tasty concoction to share on our recipe blog. 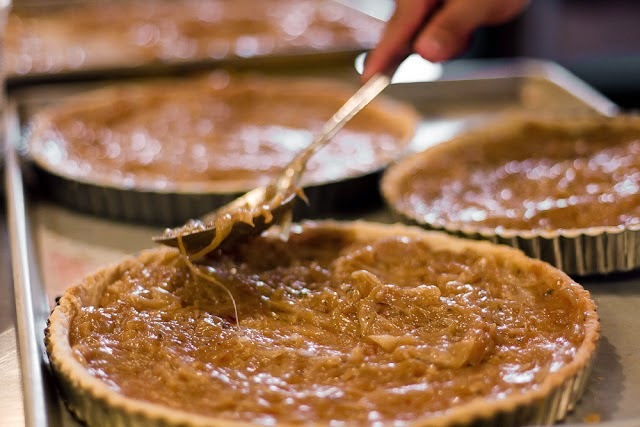 One of the guests' favorites is our Onion Tart, so after getting a crowd of requests for the recipe, we thought it would be best to make it available for everyone to enjoy. 1. Put everything in food processor and pulse until looks finely grated cheese. Add half water and pulse again. The mixture should start to come together. If the dough seems dry, add the rest of the water. Remove and wrap in plastic wrap for 1 hour. 2. Pull dough 20 minutes before rolling. Put a little flour down on work surface. Using a rolling pin, roll out dough evenly in all directions. The dough should be about 1/8 inches thick. 3. Lay dough in lightly greased 9 inch pie pan. There should be 1/2 inch of dough hanging over the edge. Fold dough underneath itself and pinch or crimp into desired shape. 4. Poke holes all over the dough with fork and bake in over 425 degrees for 10-15 minutes. 4 large yellow or purple onions. 1. Slice onions and put in skillet with 2 Tablespoon of vegetable oil. Add a little water if the onions start to stick to the pan. 1. Cut out stalks and wash.
2. Put in skillet on medium heat and add 2 Tablespoons of water. 3. Once the chard is wilted, rough chop and mix with caramelized onions. 1. Put in a pot on medium to medium high heat and reduce by half. 1. Put onion/chard mixture in pie crust and spread out mixture evenly. 2. Crumble chevre cheese all over onion/chard mixture. 3. Put into oven on 375 degrees until cheese starts to melt or get a light brown color. 4. 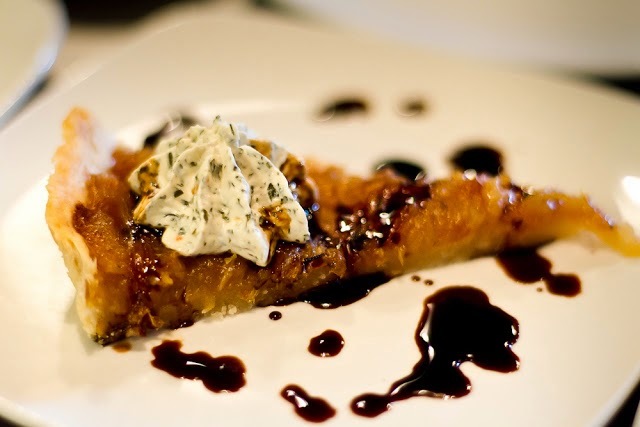 Cut slice and drizzle with balsamic reduction.